I was in London yesterday for a meeting of the IGGI team. 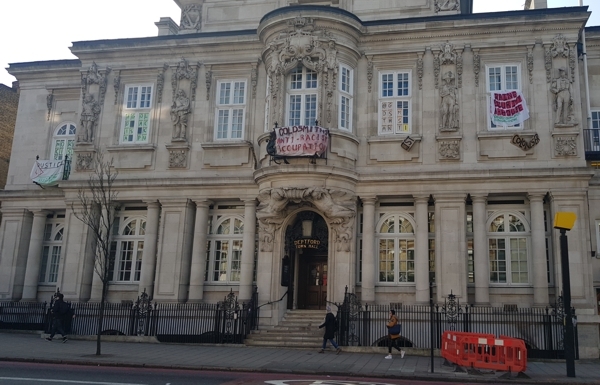 The venue was to be Deptford Town Hall, which is part of Goldsmiths college. Unfortunately, the room we had booked was otherwise occuipied. The students who occupied it made a number of demands of the college, to some of which it acquiesced. So emboldened, the students made some more demands. I expect the college will acquiesce to these, too, until the students ask for a pony each. That would probably be too much. I have to say, the catering at Goldsmiths is streets ahead of what we have at Essex. Even the sandwiches are superior, but I'd buy the chorizo and sausage rolls with my own money if they were available locally.